Once again we have the theme of water – the Sundays of Easter were originally designed to provide instruction for the newly baptized adult converts received into the Church at Easter and a renewal for the existing Christian community of their faith. The woman, who traditionally is called Photina, or Light, comes to the well at noon – the hottest part of the day. Nobody would be outside – she comes then to avoid the other women who would have gotten their household water earlier in the day. She and Jesus enjoy a bantering conversation, one that gets deeper theologically. The disciples are shocked to see Jesus speaking with a woman – why? They had women in their company. The shock is that He, a rabbi, is speaking in public and alone with a woman- in that time, a rabbi did not even speak to his wife or daughter in public. Plus this woman is a Samaritan – Jews and Samaritans did not dislike each other- they hated each other. Every encounter was dangerous, but they had to go through each other’s territory on journeys like the one that Jesus and His disciples were on. Ironically, modern DNA studies of the surviving Samaritans shows that they are indeed identical with the Jews- there is no trace of the supposed foreign blood that Jews claimed Samaritans carried. Jesus said that His mission is to Israel, but here at Shechem He extends it to another part of Israel, the Samaritans, and offers them faith in Him and eternal life. 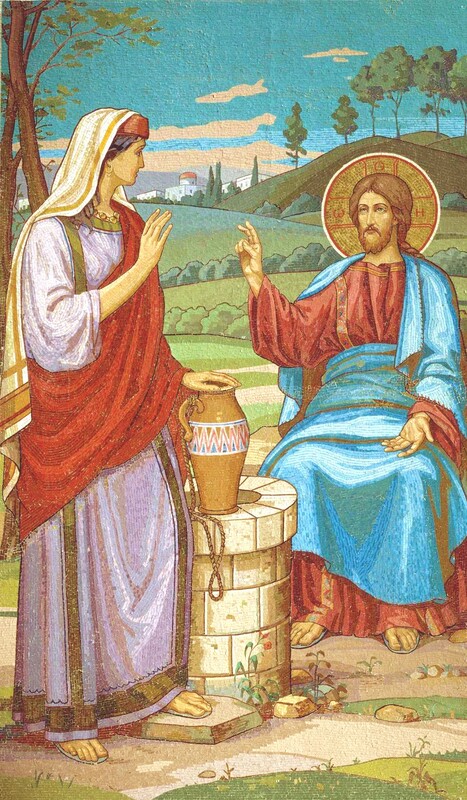 Photina goes from being thirsty for water from the well to thirsting for more of Jesus’ words – she is so affected by him that she, a woman of a scandalous life who earlier was afraid to interact with her neighbors, goes door to door and convinces everyone to leave their cool houses and walk in that heat to meet a rabbi from the despised Jews. John gives only a few of the words that she must have said, and we don’t get the full power of her invitation – Come! Come! Come! How many people here grew up in a Byzantine Catholic parish as a child? Who came to the Byzantine Catholic Church because they were invited by someone? Who found us through a book or the internet? We came, we stayed – our Church is part of the universal Catholic Church, and we will soon say I believe in the Creed. What do I believe? How do I live my beliefs? Do I believe that Catholicism holds the fullness of the revelation of the faith of Jesus Christ? Look at the icons of our martyr bishops – men and women and children have died rather than abandon the Byzantine Catholic Church and be forced into the Orthodox Church. At Pratulu\in in 1874 young men who had everything to live for died at the hands of Russian soldiers. During the Boxer Rising in China in 1900 children as young as seven died professing their faith in Christ and His Church. Entire families were shipped off to Siberia and Kazakhstan for their faith in the 20th century. Catholics in China, Laos, Vietnam, Cuba still suffer for their faith. What do I believe? How do I believe? Our Byzantine Catholic Church has many treasures of liturgy, spiritual life, community life. Invite someone to come in the next months – bring someone to the bazaar on May 12 to go on a church tour; invite someone to come when cars are blessed. Bring someone to Sunday Liturgy. Be willing to answer questions about the Faith. The western world is in a spiritual decline – while Catholics in the Amazon are thrilled to see a priest once a year, three-fourths of American Catholics can’t be bothered to show up at their local parish on Sundays. In Rio Rancho one parish has 17,000 registered faithful, but 6,000 come on the weekend. Yet attendance in our parish runs at 95% of the membership. Why are we so high on the scale in our parish? We appreciate the treasure we have of liturgy, spiritual life, community life – but it is not ours to hold alone. Family life is under pressure, Christian values are routinely mocked by comedians and politicians. We have to answer for our beliefs – not at the point of a gun as in Pratulin, not by losing our job as in China, but often over a meal, after a slanted news story comes on TV, when a teacher says Catholics are homophobic misogynistic bigots with a priesthood filled with pedophiles. What do I believe? How do I live my beliefs? We are conducting the Called By Name project to raise up vocations in our parishes for religious life, priesthood, diaconate. But our Church as a whole needs to raise up the vocations of belief. Those who come to our parishes come out of love – God is love, and he who abides in love abides in God and God in Him. The disciples formed in Antioch in the epistle today from Acts were men and women who had no background in Jewish faith about a messiah coming – they responded to the call of the first preachers of the gospel and entered into the Christian community. Many people in western society have either no concepts of Christian belief or distorted ones – a homophobic bigoted misogynistic church filled with pedophiles, or of a God Who is angry. The people of Antioch learned of a whole new way to live; the people of Shechem discover that there were Jews who loved them and that the message of the Jewish messiah was also for them. People do not know the faith, the truth, the fullness of God’s revelation, unless they are invited, unless someone steps forward. We had a girl who when she was in high school brought her Protestant boyfriend to church – now Andrea is a cantor, Dan is active in the parish, and they have five children being raised in the faith. You never know what seeds of faith you plant, but it requires learning, reading, praying, and not being afraid. Photina was so excited that she forgot her embarrassment about her life, her humiliation at the hands of others, and brought those same people to Jesus. We have to do the same. Our eparchy has to do the same, as does every eparchy and diocese. Our national Church has to do the same. Pope after pope in the last 100 years has called on the laypeople to reach out, to evangelize. Our small parish has had multiple converts, multiple people who returned to the Catholic faith as a result of being brought here, we have produced four priests, one sister and one monk even though our population has never gone over 130 souls. Jesus remains thirsty for souls. In the garden of the agony Jesus sweated blood for us, but went willingly to His crucifixion for us. 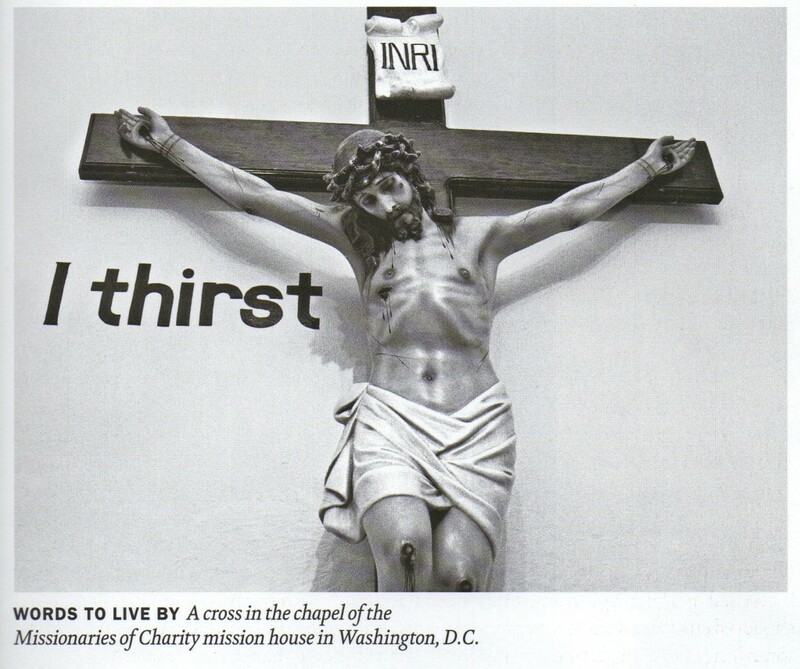 On the Cross Jesus said I thirst – not for water, but for us. Jesus raises us up to new life with Him in His resurrection. The Holy Spirit was sent down to the disciples and remains in the Church for each of us. We are more than halfway to Pentecost. Let us reach out to the Holy Spirit for guidance and help in reaching out to the souls around us. I believe – How do I live out my belief? Jesus waits for our reply.